The rationale behind the official Quizcover slogan--"Fun time well spent"--is that trivia quiz games offer two benefits: a good trivia game will provide entertainment ("fun time") and, on top of gameplay, you get information ("time well spent"). That information may just be interesting and enlightening. It may even prove useful in a professional or educational context. Trivia games are the most popular game genre to come with a tangible benefit above and beyond gameplay. The only other "instructive" genre that I could think of would be flight simulators, but the related learning curve is steep and the audience is small compared to how many people play trivia games. On different kinds of platforms (consoles, PC, smartphones), I've played games of all genres. Strategy games (I had the pleasure and honor of being involved with the marketing efforts for Warcraft II and Starcraft I). Role-playing games (Diablo). Sports games. Shoot 'em up games. Car-racing games. Casual games (I've mastered 1,400 levels of Candy Crush and built a level 78 Hay Day farm). But if I could bring only one kind of game to a deserted island, it would certainly be a trivia game, in no small part because of that extra benefit of learning about interesting and useful facts along the way. As I said in the previous post (the first one on this blog), our objective is to set a new standard for both parts of "infotainment": information and entertainment. More fun and, on top, more information. We have yet to identify a conflict between entertainment and information, but if we ever did, rest assured we'd definitely optimize for gameplay. That's the #1 priority. 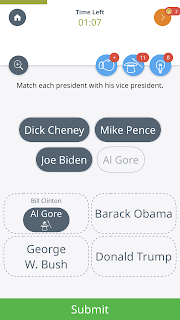 Quizcover's additional question types--Match Two and Pick Some--are more interactive and more informative than the traditional Pick One type (one answer is right, three are wrong). There's no shortage of Pick One questions in our game: for many facts, that traditional trivia question type makes a lot of sense or may even be the only suitable format. But there are many facts that can be presented in ways that are both more fun and more informative than having to pick one right answer from four options. 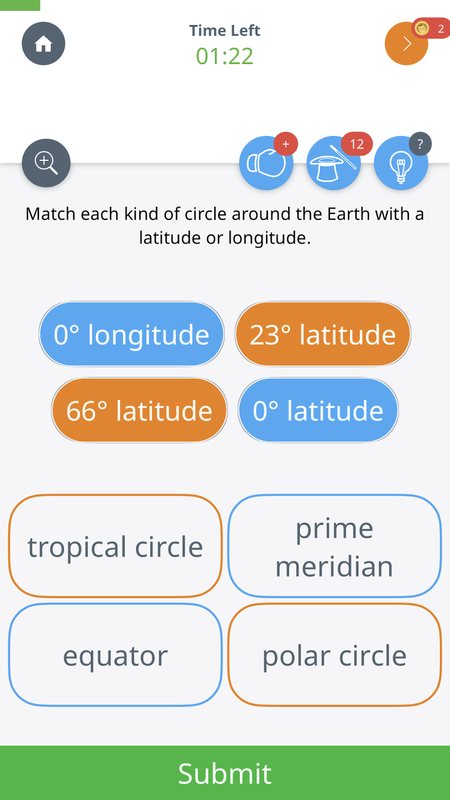 You get to drag and drop the smaller items (0° longitude, 0° latitude, 23° latitude, 66° latitude) into the container boxes below (tropical circle, prime meridian, equator, polar circle). That kind of interface is much more iPhone-like than just tapping on a single answer, which you could already have done with a Nokia phone in the 1990s (you could have pressed a number key to choose an option). A Match Two question is solved step by step. 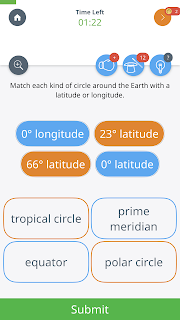 For example, if you know that the equator has 0° latitude, the number of container boxes available for the remaining three items is reduced to three. With the next one you know, you're down to two, and if you know everything else (or simply make the right guesses), the last one will fall into place. Alternatively or additionally to the Reveal booster, you can use the Hint booster (light bulb) to assign colors to all items as shown in the screenshot further above. The colors provide an important clue: blue and orange objects can't possibly belong together, which greatly reduces the number of possible combinations but still doesn't answer the entire question. It's not just about the tactical implications of multi-fact questions. In the end you also learn a lot more when multiple related facts (typically four, like in both screenshots) are presented together. thoughts on mobile games in general and the trivia game genre in particular. What we try to achieve with Quizcover is nothing short of a revolution of the trivia quiz genre. 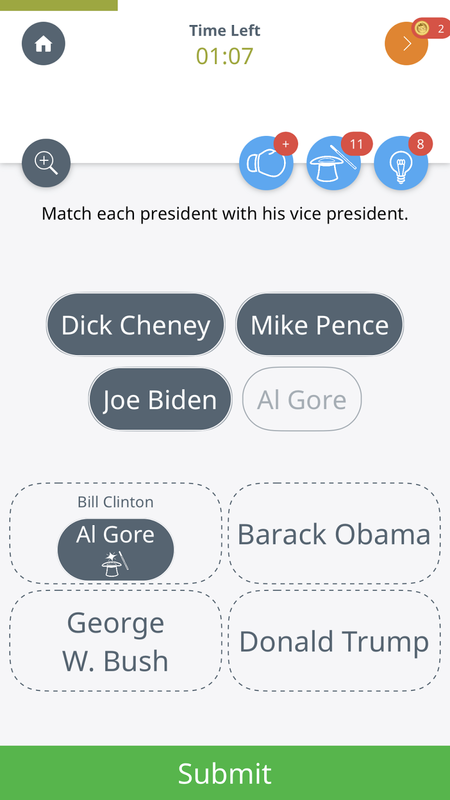 By adding more and more question types (while also supporting the traditional PickOne type, where one answer is right and three are wrong), we intend to make knowledge more playable than ever and to put an end to the monotony of conventional trivia games that only have one question type (one answer is right, three are wrong). "(enter)tainment": more than anything, we want Quizcover to be a game that offers more tactical options (new boosters) than traditional trivia games and comes with the most comprehensive set of contests and challenges. Stay tuned as we're getting ready to launch Quizcover in the U.S. market. At this stage, the content of the game is very U.S.-centric especially in such fields as sports, geography, and history/politics (though we'll increasingly differentiate our content by region).